Total 248 AA. MW: 28 kDa (calculated). UniProtKB acc.no. O14793. 243 AA of recombinant human Myostatin Propeptide and 5 extra AA (highlighted). Add deionized water to prepare a working stock solution of approximately 0.5 mg/mL and let the lyophilized pellet dissolve completely. 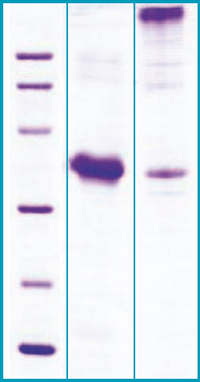 Filter sterilize your culture media/working solutions containing this non-sterile product before using in cell culture.